1875 6d Grey, SG 147, Plate 14, and Four 1d Rose-Red, SG 43, Plate 146, tied to envelope to TASMANIA by a very fine CHARING CROSS duplex. 1886 5d Dull Green, SG 193, tied to envelope to Bengal, India, by a very fine NORTHAMPTON duplex. Cat £350 on cover. 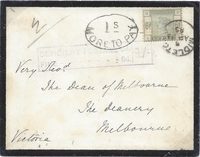 1884 6d Dull Lilac, SG 194, tied to envelope to Australia "via Brindisi" and tied by a very fine London CDS. 1875 1/- GREEN, SG 150, PLATE 11, TIED TO ENVELOPE TO CEYLON "Via Brindisi' BY A VERY FINE WINDSOR 890 duplex. VERY ATTRACTIVE. 1885 5d Inidgo, SG 169, tied to envelope to Ceylon by a VERY FINE AVIEMORE DUPLEX - AN UNUSUAL USAGE FROM AVIEMORE. 1834 Entire from Madras, India to London and redirected to Edinburgh, showing a very fine framed DARTMOUTH/INDIA LETTER, Robs IN 2. Content regards a son who has decided to relinquish his Commission. 1836 Cover from India to London redirected to Kendal and then to Bradford showing a very fine DARTMOUTH/INDIA LETTER, Robs IN 2, in Red. 1831 Entire from Calcutta to London carried by ship "TYRER" showing a very fine LIVERPOOL/INDIA SHIP LR, Robs IN 1. 1826 Entire from India to London "P. Georgiana"and redirected to Edinburgh showing a fine boxed INDIA LETTER/DEAL, Robs IN3, a Scarce Type. 1835 Entire from Calcutta to London "Pr Northumberland" and showing a very fine INDIA LETTER/ KINGSBRIDGE, Robs IN1, in Red. Very Scarce. 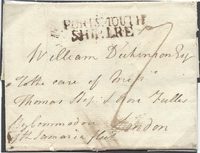 1831 Entire from "Mount St Thomas" Madras to Launceston redirected to Arlesford and showing a very fine boxed INDIA LETTER/BRIXHAM, Robs IN1, in black. Interesting content about a voyage from England to India - transcript included. 1874 2/- DULL BLUE, SG 118 AND 6d GREY, SG 125, PLATE 12 tied to entire addressed to HONG KONG by fine London/74 duplex. AN UNUSUAL FRANKING TO HONG KONG. 1834 Entire headed 'Calcutta' addressed to Edinburgh "Pr Ann" showing a very fine INDIA LETTER/PLYMOUTH, Robs IN 1. 1902 ½d Orange Stationery envelope to London franked by a ½d Blue-Green, SG 213, both tied by very fine "FIELD POST OFFICE/BRITISH ARMY S.AFRICA" cds. 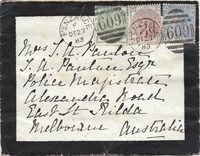 1883 Mourning envelope addressed to Australia franked by a 2½d Blue, SG 157, Plate 23, a 3d on 3d Lilac, SG 159 and ½d Pale Green, SG 165, tied by superb PENZANCE '609' duplex. SUPERB! 1867 6d Lilac, SG 97, Plate 5 and 4d Vermilion, SG 94, Plate 7, tied to small envelope to SIRONCHA, INDIA by fine Inverness '183' duplex. 1836 Cover from London to Cape Town showing a fine oval PAID SHIP LETTER/♔/date/LONDON in Red, Robs S 49.